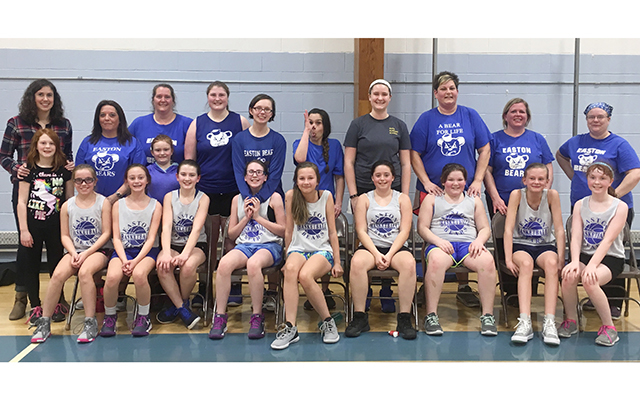 Saturday, Feb. 17, was National Random Acts of Kindness Day and Girl Scout Troop 691 of Easton decided to celebrate by doing kind things for people around Easton and Presque Isle. Their first stop was the West Ridge Manor, where they shared cookies made by Hannah Croteau and Makenna Beaulieu with the residents. After that, the girls traveled to The Aroostook Medical Center in Presque Isle, where they gave goodie bags with hand warmers to the staff providing a drive-thru flu shot clinic. Then they headed next door to the Presque Isle Rehab and Nursing Center with a variety of gifts to make the residents smile. Girls had single roses, treat sacks with cookies and uplifting cards to hand out. 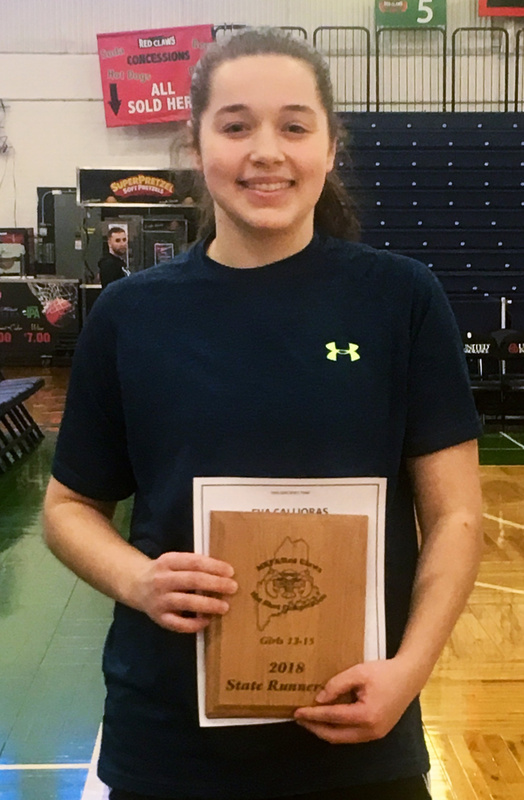 Eva Callioras recently competed in the Maine Parks and Recreation’s Red Claws Hot Shot competition at the Portland Expo. 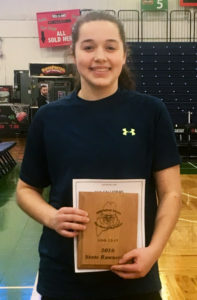 She received a runner-up award. Troop 691 finished out the day by greeting kids at Wal-Mart with lollipops. Every small gift and gesture was met with a smile, and the Girl Scouts had a great time bringing a little bit of kindness to our community. Troop 691 would like to give special thanks to Country Farms Market for the discounted roses. Participating from the troup were Hayley Shannon, Alexis Pelkey, Chloe Lento, Lilah Pelkey and Kaeleigh Swanson. Easton’s 2018 annual town meeting will be held Monday, April 2, 2018. Polls for election of selectmen and school board members will be open from 9 a.m. to 6:30 p.m. at the Easton Town Office. The open town meeting will begin at 8 p.m. at the Easton Elementary School cafeteria. Residents should bring their town reports to the meeting. Please send Box Tops for Education to Easton Elementary School in an envelope (if you have a child in the school, please identify with his/her name). The Easton PTO has launched the latest penny fundraiser. Funds raised will be used toward the purchase of future playground improvements. Each classroom will collect pennies, but really, any form of money works. Each week the classroom totals will be displayed on the wall at the entrance to the cafeteria. Tallies are by classroom, not individual student. The classroom winner will be decided by the highest amount of money collected per student. Bonus points will be given to money that does not have to be counted (rolled coins, bills and checks). Thanks for your support. The Easton School Department Wellness Team will host the Aroostook County Action Program and Aroostook Health Network’s showing of “ScreenAgers” on Wednesday, March 21, at the Easton Elementary School. The award-winning film probes into the vulnerable corners of family life and depicts messy struggles over social media, video games and academics, and offers solutions on how we can help our kids navigate the digital world. This viewing may be appropriate for ages as young as 8 with an adult. The Easton PTO will provide snacks and childcare. The Easton High School National Honor Society recently held its induction ceremony for new members on March 6. 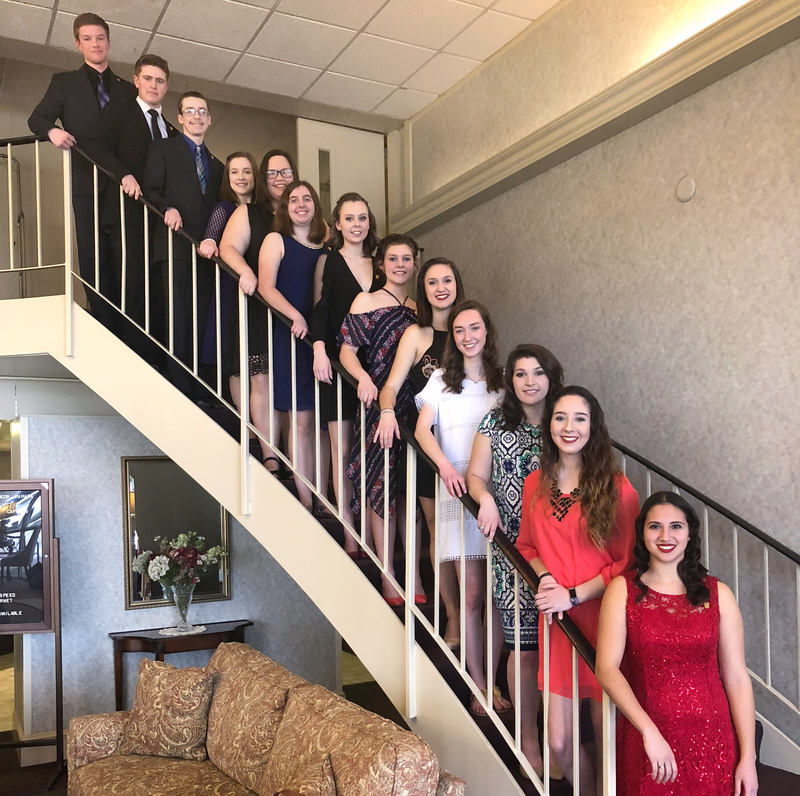 This year the chapter inducted five people: Lila McCrum, Joshua Rooney, Isaac Wipperman, Kaitlyn Faloon and Grace McCrum. On March 15 and 16, the chapter traveled to the state convention in Orono. Please consider supporting Easton’s 2018 Project Graduation by bringing your cans and bottles to the Presque Isle Redemption Center. Just ask them to apply the total to the 2018 Easton Project Graduation account. This fundraiser will be going on from now until May 15. On Saturday, March 24, from 11 a.m. to 12 noon, the Francis Malcolm Science Center planetarium will showcase photography by Paul Cyr. Cyr’s broad range of nature and aerial photography encapsulates the color, motion, and sheer beauty of seasonal changes in the Crown of Maine. Reservations are required by calling (207) 488-5451 or e-mailing tricia@francismalcolmsciencecenter.com. The cost of admission is $5.00 adults and $3.00 children. 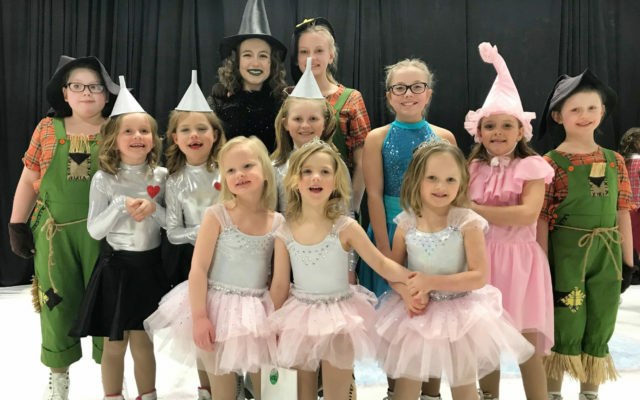 The Easton Recreation Department is planning a trip for the live show of “The Wizard of Oz” at Cross Insurance Arena in Bangor on Tuesday, April 10. 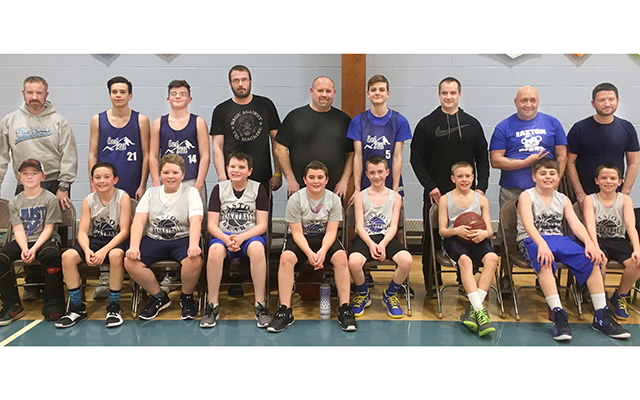 The bus will depart from the Elementary School at approximately 2 p.m. and will feature dinner at a Bangor area restaurant. The show starts at 7:30. This is open to adults, families and community members. Children must be grade 6 and above to attend without a parent. Ticket must be paid in full by March 16. Please contact the Easton Town Office at 488-6601 for more information or to secure your seat. There must be a minimum of 12 to offer the trip; 48 seats are available. The cost of the ticket and transportation is $50. Participants will be responsible for their meal. The Easton Community Celebration Calendars have arrived at the Town Office. Please pick up your copy (copies) as soon as possible. There are extras available. The Easton School Department is now accepting registration for children entering Kindergarten or Pre-K in the fall of 2018. All children residing within the Easton school district who are 5 years old (on or before Oct. 15, 2018) are eligible for enrollment in the Kindergarten class. All children residing within the Easton school district who are 4 years old (on or before Oct. 15) are eligible for the Pre-K class. Call the Easton Elementary School at 488-7700 as soon as possible to register your child for either of the above classes. The classroom teacher will notify parents/guardians when an informational meeting for parents is scheduled. The state of Maine requires the following documents: (1) Proof of immunizations, (2) birth certificate (hospital copies are not acceptable), and (3) proof of residency (rental agreement, utility bill, etc). These documents must be presented prior to the child beginning school. 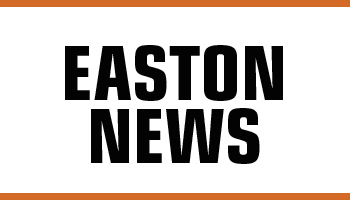 The community library at Easton High School will no longer be open for regular hours on Saturday mornings. In the future, library services will still be available on an “as requested” basis. To arrange a mutually convenient time please contact Steve Demaio at 805-2702. Bone Builders class meets each Monday and Friday starting at 9:45 in the Recreation Room at the Manor. Bone Builders is a free strength training, balance and exercise program. The program’s goal is to prevent and reverse the effects of osteoporosis. This class is for women and men who want to stay healthy. You must have a doctor’s permission to join the class. To be successful, you should commit to attending twice a week for six months. You’re never too old. Studies have shown that strength and fitness can improve at any age. This program relies on weight training and balance exercises to protect against fractures caused by osteoporosis. Each one-hour classes, held twice a week will increase muscle strength, balance and bone density. This program is offered through Area on Aging, Cary Medical Center and the Easton Recreation Department. Hillary Hallett is the correspondent for Easton. She can be reached by sending an e-mail to: hillary_jt@myfairpoint.net or calling 551-7737.